Nobivac 1 - Rabies (10 dose) (Merck) is a 1 year rabies vaccine labeled for the prevention of rabies in dogs, cats and ferrets. Do Not give to Horses. Give a 1 ml dose. 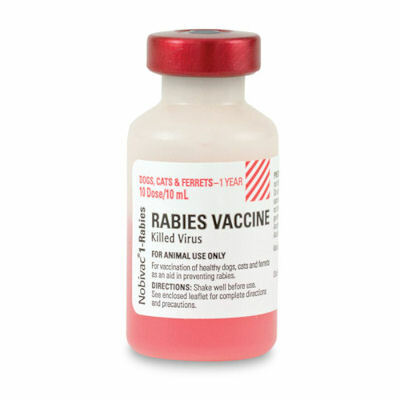 Rabies vaccines CANNOT be sold to the following states: AK, AL, AR, CA, CT, GA, HI, IA, Id, IL, IN, KS, MD, ME, MN, MO, MS, MT, NC, ND, NH, NJ, NM, NV, NY, OK, OR, PR, RI, SC, TN, TX, UT, VT, WA, WV, WY.